It won’t come as a surprise to you that I’m a big advocate for the power of technology in performance management. At Cognology, we see the business impact of great performance management technology almost every day. But in this article, I wanted to go a step further and understand if there’s broader scientific support for the power of performance management technology. As you’ll see, there’s a range of strong research demonstrating how technology continues to fundamentally change performance management. Great technology is preceded by a great process and it can start today. 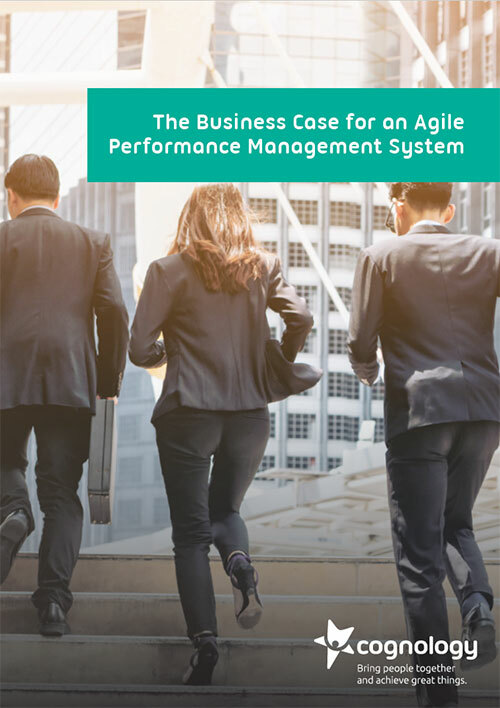 Download The Business Case for an Agile Performance System and transform your organisation. In preparation for this article our team spent many hours trawling academic journals on performance management. The aim was to find well-cited academic papers that specifically looked at technology in the performance management space. 1. Technology drives more positive attitudes about performance reviews. Gueutal, H., & Stone, D. L. (2003). The brave new world of e-HR. Advances in human Performance and Cognitive Engineering Research, 3, 13-36. 2. Technology-enabled performance management tools encourage managers to develop better ongoing performance management behaviours. Hunt, S. T. (2011). Technology is transforming the nature of performance management. Industrial and Organizational Psychology, 4(02), 188-189. 3. Technology increases the effectiveness of performance feedback. 4. Basing performance management around projects rather than time of year highlights the optimal time for reviewing performance. 5. Data from performance management technology is critical in identifying and tracking high-potential employees. Stone, D. L., & Stone-Romero, E. F. (2003). and Kimberly Lukaszewski. Advances in human performance and cognitive engineering research, 3, 37-68. 6. Developmental opportunities and potential mentoring relationships are more easily discovered through performance management data. 7. To effectively manage performance employees must be involved in goal setting, using technology. Kagaari, J. R., Munene, J. C., & Mpeera Ntayi, J. (2010). Performance management practices, information and communication technology (ICT) adoption and managed performance. Quality Assurance in Education, 18(2), 106-125. 8. Technological tools can be particularly helpful to complete the performance planning process when manager and employee do not work out of the same location. MCI World Com, 2001, as cited in Joshi, S. K. (2014). Role of Technology in Performance Management System: A Literature Review. 9. The essential components of defining, facilitating, and encouraging performance are even more critical in a virtual work environment than in a traditional one. Advances in human performance and cognitiveengineering research (Vol. 3, pp. 1–12). Oxford, UK: Elsevier Science. 10. The importance of developing clear, objective goals is promoted in the absence of frequent face-to-face communication between the subordinate and supervisor. Manoochehri, G., & Pinkerton, T. (2003). Managing telecommuters: Opportunities and challenges. American Business Review, 21, 9–16. Ellison, N. B. (1999). Social impacts: New perspectives on telework. Social Science Computer Review, 17, 338–356. Illegems, V., & Verbeke, A. (2004). Telework: what does it mean for management?. Long Range Planning, 37(4), 319-334. 11. Instead of spending time asking people to “please fill out their talent forms”, HR uses data generated from cloud technology to gain insights that drive strategic discussions. 12. Digitalisation of performance management not only provides better data, but also “positively influences management processes and strategic development”. Tambo, T., & Gabel, O. D. Discussing performance management architecture in public service broadcasting. In PMA (Performance Management Association) conference 2014. 13. Performance management technology is critical not just as a business intelligence system, but also as an analytical online process, a data warehouse and a simulation tool. Ballard, C., White, C., McDonald, S., Mylymaki, J., McDowell, S., Goerlich, O., & Neroda, A. (2005). Business Performance Management: Meets Business Intelligence. IBM. Tambo, T., Gabel, O. D., Olsen, M., & Bækgård, L. (2012). Organisational Dynamics and Ambiguity of Business Intelligence in Context of Enterprise Information Systems–a case study. CONFENIS, 1-16. Smith, M. A., & Kavanagh, S. C. (2008). The Potholes of Performance Management Technology: A New Road and Its Obstacles. Government Finance Review, 24(3), 63-66. This research clearly shows that better technology is making performance management a part of everyday work life. As I’ve spoken about previously, this is a huge step in the right direction towards more natural, agile performance management. It’s evident that the widely known benefits of performance management technology (such as the efficiency, accessibility and relevancy of performance management) are only the tip of the iceberg. It’s also great that the impact of performance management data on high-level strategy is becoming more defined (and attracting a lot of attention). This is good news in making sure all businesses recognise the significant benefits of best practice performance management technology at the highest levels of leadership. I’m planning to keep this ultimate guide up-to-date over time. 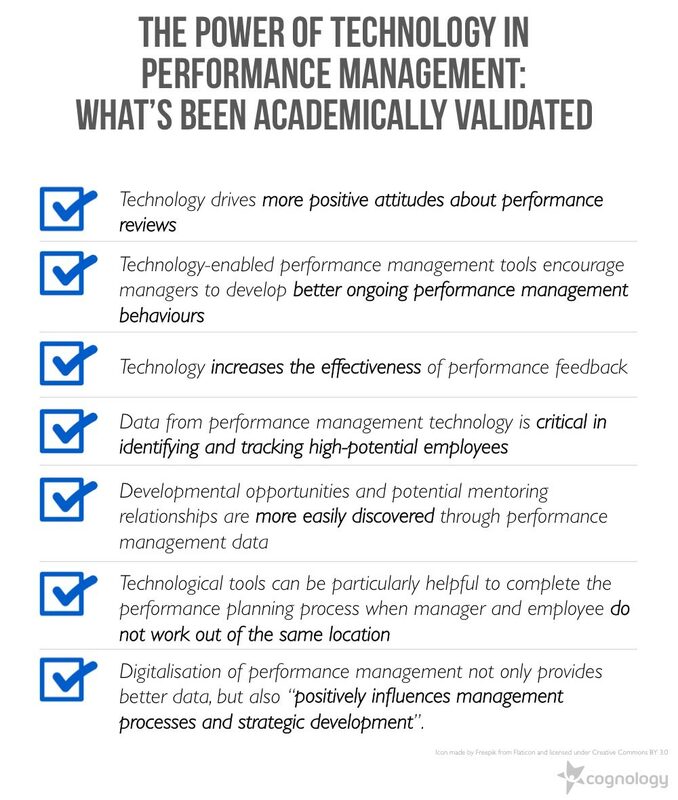 So if you see any more well-cited research on the power of technology in performance management, please let me know via twitter @Cognology. How to make feedback less stressful What does an ageing workforce mean for performance management?